Novotel Barcelona City is perfect for a romantic weekend, family vacation or business trip. Immerse yourself in our restaurant's Mediterranean flavors and enjoy incredible views of the city from our terrace on the 19th floor. The hotel is located opposite the Torre Glòries and features well-equipped rooms, an outdoor pool, fitness center, solarium, meeting rooms - everything you need to feel at home. Staying with us is the best way to discover Barcelona. With its cosmopolitan vibe and streets imbued with art thanks to the famous architect, Gaudí, Barcelona is one of Spain's best-known cities. Whatever your taste, there's so much to do in this city that you'll never feel bored! This Novotel hotel is located on one of the main streets (Avenida de la Diagonal) in the heart of Barcelona. The hotel offers easy access to the Sants train station and is located 1.2 miles from the beach and 2.5 miles from the iconic Gothic Quarter. 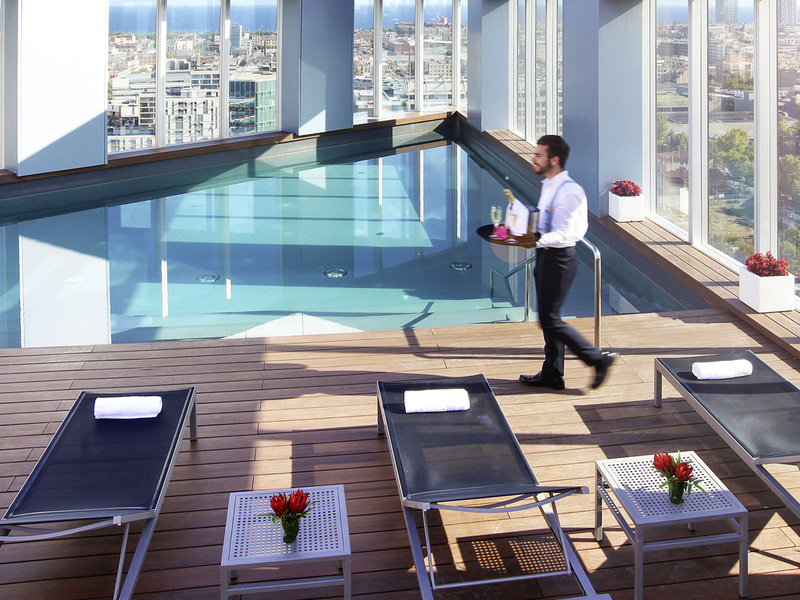 Book the Novotel Barcelona now and visit Barcelona. There's so much to do in this city that you won't have a second to spare. Enjoy the tranquility of the beach and one of Spain's most cosmopolitan cities. The outdoor swimming pool is located on the 19th floor of the hotel. "Combine work and relaxation. Spacious rooms with contemporary design. At Novotel Barcelona City, you are our priority, which is why our rooms adapt to your needs. Rooms are located on the 7th floor upward. Serving an exquisite lunchtime menu created based on our Chef's best suggestions. With Family & Novotel, children and their parents are our pampered guests. Simply sit back and enjoy your dinner with us. Make the Zity Bar your new meeting place. Exclusive terrace on the 19th floor with the best views of the city. It is the perfect place to enjoy one of our cocktails and take in the sunset. Located in the lobby, it is the perfect place to have a coffee at any time of the morning. Serving a delicious breakfast prepared with high-quality produce. Great location and breakfast, very family friendly. The hotel was clean, busy but friendly. The restaurant and breakfast were great. There is a wide choice on a morning. The lobby is child friendly with lots to do for all ages I travelled with children aged 6 to 12. In addition though a little cold for the pool there is a lovely roof terrace bar with amazing views. Many thanks to the friendly staff, either at the reception during check in or check out, or in the restaurants & bars. The room was perfect, clean & spacious. Shame we couldn't use the rooftop pool this time, due to the weather. Once again thanks to all the hotel employees. Very friendly personnel which - especially for frequent customers - strives to make your stay as pleasant as possible by giving you rooms according to your preferences. I don't recall all the names but at the reception Olga, Tatjana, Enric, Raul and others recognized me as a frequent and valued customer and treated me as such. The same applies fully to Inma (?) at the restaurant. The friendly and considerate personnel is probably the main reason for coming back to this hotel for such a long time. Great short stay at Novotel Barcelona City. Comfortable large family room with tea/coffee making facilities. Plenty of bedroom space and super large bathroom. The coffee shop was not open on the ground floor (we stayed in April). If you wanted a drink in reception, you had to go up to the 19th floor to bring it back down! Professional & Friendly staff, a pleasure to stop there with me family. The room was spacious and clean. Breakfast was rich and tasty. The staff was very friendly. Rooms were clean and tidy breakfast was good with a good variety of things. At Novotel, Glòries in Barcelona - The rooms were clean and the staff very cordial. It’s a very family friendly hotel. The food is great and best was the morning breakfast! So sumptuous! It just made our holiday so smooth and effortless! Highly recommend! Stayed for 3 nights with family. Hotel location was great and staff courteous. The blanket given for sofa bed bad was old and over used with old spot and marks. I would have never used such a blanket at home. However did not want to create fuss so survived three nights. Health centre - the main selling point of this hotel, one machine was broken so there was nothing except a treadmill. Litter such as plastics bottles and rubbish was floating in the pool, which was not a good sight. The Hamam/ sauna was closed, Reception informed that I have to contact them if I would like to use it and to start it will be very cold. Have stayed in Novotel for many years but perhaps not again. Busy hotel with friendly and helpful staff. Multiple issues with the room keys not working, our keys were replaced 6 times in the 4 night stay which was a bit annoying and we encountered many guests having similar issues. The room was clean and comfortable. The hotel is in a good location, close to shopping and transport. Would definitely stay there again. Great location, very close to the metro and city tour bus. Super hotel, very friendly and accommodating staff. Stunning views and great service from the roof top bar. Dinner menu could be improved. Heated outdoor pool would be good. The staff was truly very helpful. I found the conference rooms where I spent 3 days very dull and dark. I would be helpful if they were more bright. Everything went smoothly and the maid service was exceptional and always service with a smile. Everyone was pleasant an very accommodating. The maid service was good and service was prompt and always service with a smile. The breakfast buffet was amazing - compliments to your chef on the variety of foods offered and the beautiful display ! The snacks between our meetings were very healthy and the mini sandwiches were ideal for the hungrier appetites !